In the past decade Madrid has astonished the world with its explosion of Metro construction. It has amazed not only for the scale of its ambitions, but with timeframes and budgets that would make other cities blush. With two major project phases (1999-2003, 2003-2007) Madrid Metro has cast itself as one of the world's most extensive systems. 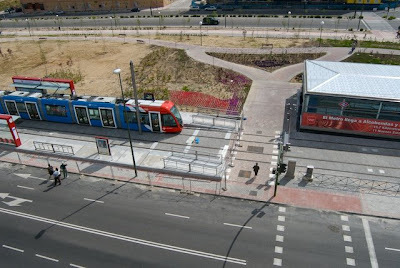 Phase One included the new Line 12, or "Metrosur" which runs in a loop around some of Madrid's southern suburbs, and a Line 10 extension to reach it from the city. The Second Phase was even more ambitious, including 10 Metro extensions and three new light rail/tram lines (see map below). 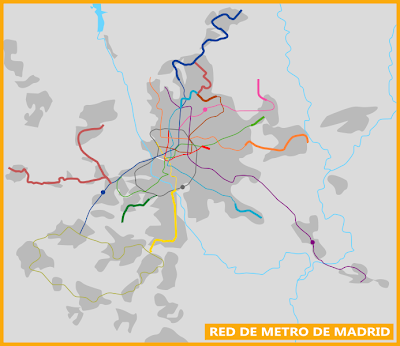 Scale map of the Madrid Metro network. Thicker lines denote new construction 2003-2007 (47.4 km of metro lines with 42 new stations plus 28 km of light rail lines with 39 new stations). Metrosur is the green loop line at bottom left. This was achieved under the guidance of Metro President Manuel Melis, quoted from this article. Talking of the Metrosur project Mr Manuel Melis said construction had gone according to plan, though he admitted that the timescale could have been even shorter. He said: "We completed everything on time and within budget In fact, we could have finished six months earlier because we were too conservative in our planning. Tunnel construction went faster than we expected." The entire cost of the 1999-2003 metro development programme amounted to [euro]3.16 billion. These projects, incorporating Metrosur and the Line 10 extension, included planning, civil works, electrical and mechanical installations, interchanges, maintenance facilities, and rolling stock at an average cost of [euro]42 million/km. Previous projects have been undertaken successfully on the same basis, as Melis explained. He said on that occasion: "I believe that rail transport projects are simple engineering projects, easy to design and build, and, with the appropriate staff and management techniques, they can easily be completed on time and within budget. I refer particularly to those Madrid Metro projects where completion dates have not only been met, but have been beaten by several years in comparison with similar projects elsewhere." "Civil works amounted to about 70% of the total cost of our programmes. The most important part of this cost is the tunnel part. Transport infrastructure projects can be divided easily into manageable parts. Each section of the project can be designed simultaneously and all contracts can be awarded simultaneously, so that any manageable contract worth up to [euro]150 million, for example, can be completed within three years. Even enormous tunnelling projects such as the Channel Tunnel have been excavated in this timescale. Therefore, provided that funds are available, any lineal project such as a metro can be designed and built in 40 to 45 months, as we have demonstrated. 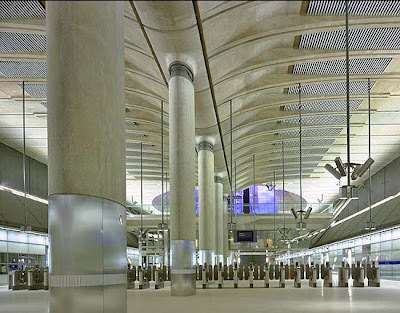 "Station architecture is an important factor, too. It should never be handed over to world-renowned architects. A transport project is a serious engineering work that should not be confused with a museum or an emblematic building for a city. Several million passengers/day may move through metro stations, so their design must take into account this fact by giving easy access from the street to the trains, via wide escalators and corridors and shallow station platforms. 16km long with 11 stations, about 80% underground and 20% overground on existing rights of way; took 9 years to build from authorisation to completion at a whoppingly over-budget £3.5bn, or £218m/km. I'll repeat that because it's an important figure and won't even bother converting it to Euros. Jubilee Line Extension: £218m per kilometre. Metrosur: 42m Euros per kilometre. That's roughly 6 times the price/km. i.e. if the JLE were being built in Spain they could have built 6 of them for the same money! Canary Wharf station on the Jubilee Line. Designed by world-renowned architect Sir Norman Foster, the station has been likened to a cathedral. It's an impressive achievement, but for the same money five or six simpler stations could have been built. Furthermore, construction of the Victoria Line took 10 years. The Chelsea-Hackney Line was thought up in 1901 (!) and has still not come to fruition (although it arguably shouldn't, in its current form). The East London Line Extension was put forward in the 1980s and phase one completion is due in 2010. Relatively simple extensions to the Bakerloo, Victoria and Northern Lines are operating on a, shall we say, "open" timescale. Could it be London has a project management problem, rooted in a flawed philosophy? After all, why should projects take so long and go so much over-budget when cities like Madrid demonstrate time and again that with the right approach, large infrastructure can be built far more easily and cheaply than we in London perceive? 4. Metro Lines are expensive, difficult projects of questionable benefit, that take a long time to design and construct (high investment, low return). 4. Metro Lines are affordable, straightforward and worthwhile projects that take a short time to design and construct (low investment, high return). "This latest project demonstrates again the importance of our philosophy. Many cities around the world desperately need new metro lines, but they cannot afford to build them at an estimated [euro]150 million to [euro]200 million/km, nor be forced to wait a dozen years for the lines to become reality. These estimates of costs and time are simply wrong. In Madrid, with all humbleness, we have now proved it on more than one occasion. And it does take on something of a religious aspect when you consider that Seville, Barcelona, Bilbao, Valencia, and Malaga are all doing the same, within an economy far weaker than the UK's. London has one or two lines in the distant pipeline, the £16bn Crossrail line and the aforementioned Chelsea-Hackney Line. Relatively simple extensions to the Bakerloo and Victoria Lines are indefinitely mothballed. Outside London there are no new metro lines planned at all. Even very large cities such as Manchester and Birmingham have opted for surface light rail schemes, though the potential for full metro exists. Clearly one of the mistakes made on the Jubilee Line Extension was to employ just those "world-renowned architects" Sr. Melis said we should avoid. Over-ambitious, monumental stations overran the budget for no gain to the passenger other than a brief "wow" on first visiting the station, followed by another "wow" upon seeing the ticket price. Britain has probably learned its lesson on this front, but is still waiting for its own evangelical Sr Melis to spread the gospel. Until then, all its pagan superstitions about Underground construction are likely to be self-fulfilling. I watched the London Underground Revealed show from National Geographic recently (Xmas gift) and it stated that the JLE stations were designed so large to incorporate the lessons of the Kings Cross fatal fire. That is, much larger station and open escalators so that fires don't induce a Bernouilli effect up the escalator which lead to the small initial fire basically exploding upwards. Also, all the station material is concrete & steel. With that, no fire sprinklers are installed in the JLE stations.